Step into the fantastic world of anime and manga with this lovely illustrated book focused more on mise en scène than character. Heavy on imagery and light on text, it takes you into the world of predominantly Japanese comic art. Available on Amazon in paperback and Kindle editions. You can find it at other online and offline booksellers, as well. 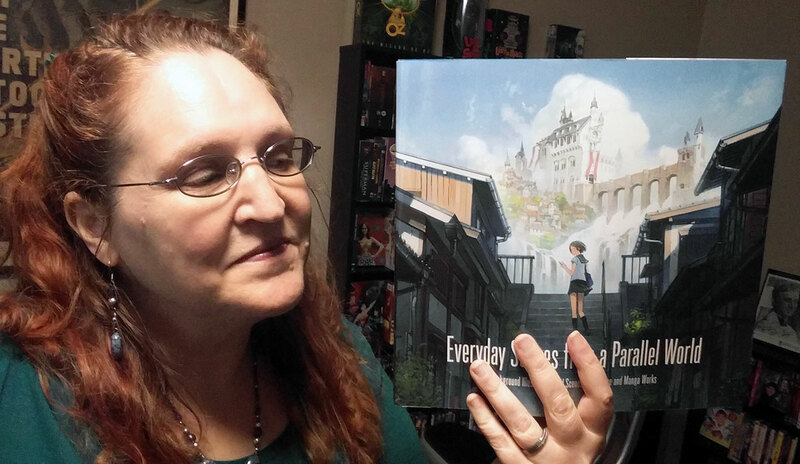 Turning the spotlight on overlooked scenes and background illustrations, Everyday Scenes from a Parallel World celebrates the art of anime and manga. It features the work of 39 well-known, predominantly Japanese creators, illustrators, and animators. It also includes explanations of drawing techniques and materials, as well as provides creator profiles. This book really lets you enjoy the art. There are a variety of styles, which gives you a feeling for the range of art available in anime and manga. The format of the book, 10 x 0.5 x 9.5 inches, gives space for the images to be large enough for you to enjoy by taking it all in at once, as well as by looking at each individual detail. Captions for each piece tell you the title of the art in both Japanese and English. Profiles of the artists are found at the back of the book, again emphasizing the art over the artist, and are also available in both Japanese and English. At the end of the book is a showcase of the cover illustration process. However, the explanations are all in Japanese with no English translation. I think this book would be well served by a hardcover edition. I’d also like to see an English translation of all text, especially the cover illustration process at the back. My older eyes would also appreciate the bulk of the text to be a bit larger. I had to strain to read the artist profiles. This is a lovely art book that would be enjoyable for a variety of people. Anime and manga fans will enjoy perusing the art. Artists might find inspiration for their own works. And Japanophiles will appreciate this uniquely Japanese style of art.